Getting started with Snow Owl is a link to the Snow Owl User Guide and this Getting Started guide. New and noteworthy gives you access to the latest release notes. 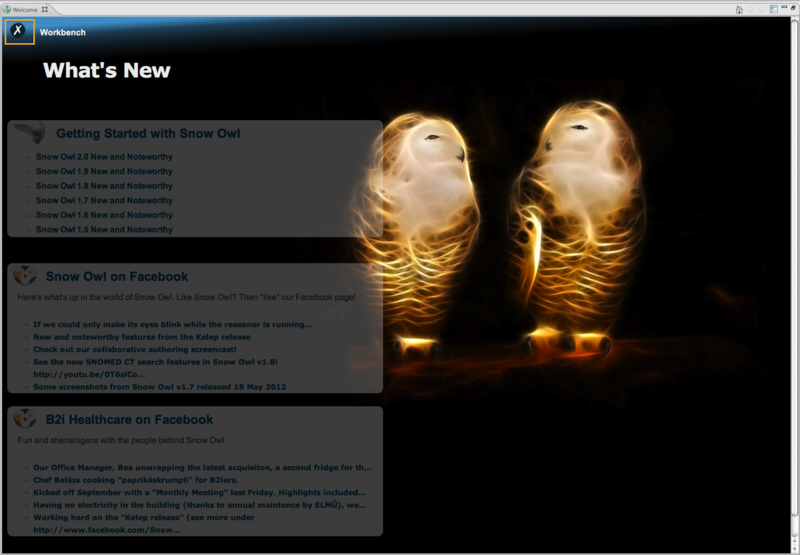 Snow Owl on Facebook displays information about new features, screencasts, and other geeky stuff. B2i Healthcare on Facebook will bring you to our Facebook site where you can meet the team behind Snow Owl, see pictures of our life in the office, or get information about the animals that provide a code name for each release. Have you done enough Internet surfing and are ready to start using Snow Owl? Close the screen by clicking the X in the upper left corner (indicated by an orange box in the screen shot), this will take you to Snow Owl. If you want to bring up the Welcome page again when working with Snow Owl, just use Help > Welcome in the menu. When Snow Owl is launched for the first time, you will see the Authoring Perspective displayed in the screenshot below. It is comprised of six sections that provide different views and give access to a range of functionalities such as browsing, authoring, and creating reference sets. Some sections contain several views that are separated by tabs, they are called stacks. SNOMED CT view: Displays concepts in a tree structure that reflects their hierarchy. Detailed information about this view will be given in the SNOMED CT concepts view section. LOINC view: Displays LOINC parts and codes. These views are sometimes referred to as concept navigators. Parents view: Displays the parents of a selected concept. Parents are displayed at the bottom of the tree structure (which is inverse to the way they are displayed in the concept views above). Problems view: Displays errors, warnings, and information messages about the concepts. For example, validation errors resulting from classifying the ontology are displayed here. Bookmarks view: Allows you to bookmark concepts to make it easier to find them again (just like the bookmarks in your Internet browser). Commit Information view: Displays the latest changes to the terminology, including the person that made the change and their comment about the change. Graph Visualization view: Displays SNOMED CT concepts graphically. Reference Set view: Displays reference sets grouped by their type. Task List view: Provides a list of tasks used in collaborative authoring. 6. The top middle section is empty (in gray), this is where the editor will be launched. Before we start working with Snow Owl, it is important to be familiar with the various elements of its user interface: views, editors, and perspectives. A view is a visual component that is typically used to navigate a list or hierarchy of information (such as the SNOMED CT Concepts), or display information for the active editor. An editor is also a visual component that is used to edit or browse a resource. The visual presentation might be a concept editor (e.g. terminology concepts or reference sets) or a text editor (e.g. scripts). Editors are launched by clicking on a resource in a view, e.g. by double-clicking a SNOMED CT concept. Tip: It might be useful to display two (or more) editors side by side. This can be achieved by dragging the editor tab to any side of the editor section. A small black arrow will indicate where the new editor window will be docked (if a tab icon appears the icon the editors will be displayed behind each other). More detailed information and screenshots of the side by side display will be given in the Editor section of this guide. A perspective is a combination of views and editors. It defines which visual components are displayed and their layout. The size and position of editors and views can be easily changed and is discussed below. Authoring Perspective: Is the default setting. Displays the largest number of views and gives easy access to most features. Reference Set Perspective: Useful for creating reference sets and editing their members. 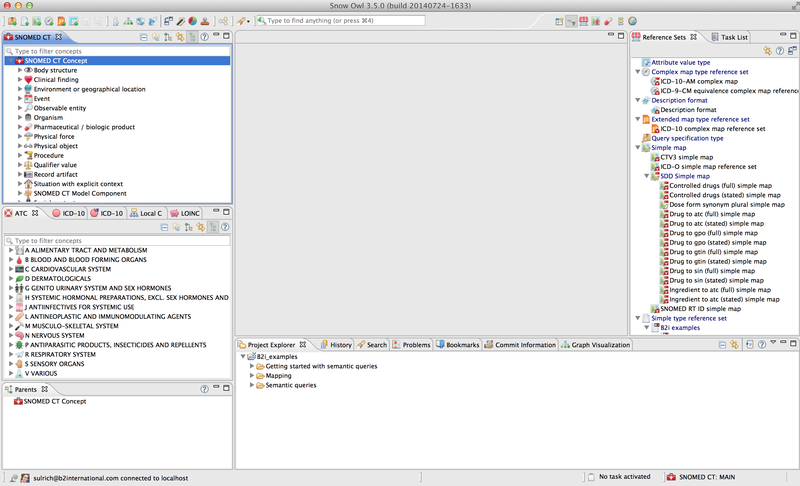 Displays the reference set view to the left and the editor to the right. Mapping Perspective: Useful for mapping SNOMED CT to other terminologies such as ICD-10. Displays SNOMED CT Concept view to the left, editor in the middle and ICD-10 View to the right. Value Domains Perspective: Useful for adding concepts and codes from different terminologies to a value domain. Displays Value domains view on the left, editor in the middle, search results view in the bottom section and different terminology views on the right. 1. The fastest way is to click the corresponding icon on the top right toolbar. 2. There is also a toolbar icon that allows you to open a perspective: After clicking the icon, select Other... to open a pop-up window that displays the different perspective options. 3. It's also possible to select Window > Open Perspective > Other... from the menu bar to open the pop-up window with the different available perspectives. Visual components such as views and editors can be arranged according to your individual preferences. You can close a view or an editor by clicking the close (x) button in the tab or by right-clicking the tab and selecting Close. If you want to bring back a view, go to Window > Show view on the menu bar and chose the view you want to open from the drop down list. Tip: If you want to close several editors at once select Close All, if you want to keep only the active editor select Close Others. To move a view or editor, drag it by its title bar and move it without releasing the left mouse button. As you move the component, the mouse pointer changes to one of the drop cursors, e.g. an arrow or a stack. When it is in the location that you want, release the left mouse button. The drop cursor indicates where the component will be docked if you release the left mouse button. An arrow indicates that it will be docked as a separate component, a stack that it will be docked as a tab in the same pane. You can create a detached window by dragging the curser outside of the Snow Owl area. Another way to move a view (or a stack) is the pop-up menu (right-click anywhere in the view's title bar). This menu will also provide shortcut options for turning a view into a detached view. Views and editors can be minimized (use as little space as possible) or maximized (use as much space as possible) by clicking the dedicated icons on the stack's border. Another option is to select the Minimize or Maximize item on the context (right-click) menu for a stack. Tip: The easiest way to maximize and restore is by double-clicking on a stack or by pressing Ctrl+M. When you minimize a stack a small set of icons (a trim stack) will appear in the area at the edges of the window (the trim). Stacks get minimized into a trim representation that contains the icons for each view (e.g. a icon for the ATC view) or a placeholder icon representing the entire editor area. The trim stack also contains a restore icon for getting back to your original layout. Tip: Clicking an icon in the trim stack temporarily displays the view, much like opening a drawer. Clicking the icon again will hide the view again (like closing the drawer). The view will also close when you click somewhere outside of the view. This can be useful when working on notebook computers with smaller displays, as you can open the views only as you need them. Once you are ready to save your changes, select Window > Save Perspective As... from the main menu bar. Snow Owl will automatically add a Snow Owl icon to the top right toolbar, which will give you easy access to your saved perspective. Less speedy ways to open your saved perspective are the main menu bar ( Window > Open perspective > Other..) or the Open perspective (> Other) icon in the top right toolbar. Warning: There is no delete function for a saved perspective. You can change an existing perspective by overwriting it with a newer version. Tooltips are very helpful for getting to know your user interface. A tooltip is a small graphical element that appears when moving the cursor over an item. Within Snow Owl many icons and several areas (e.g. SNOMED CT concepts, descriptions in the concept editor) have additional information that will be displayed this way. E.g. hovering over a concept will display its number of children, hovering over an icon in the tool bar will show you its functionality. Views and editors have icons to maximize or minimize its size. The help icon will open a help menu with the corresponding subchapter. More information about the other icons will be given in context of their use.